When starting a new business, you want everything to be as straight forward as possible so why not let us help you with our convenient stationery starter packs! We ensure that your business has a professional image by having our professional printers produce your stationery. 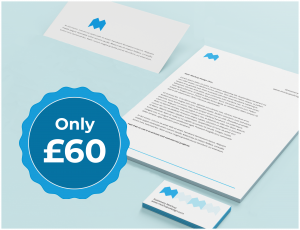 By purchasing a starter pack from GM Design & Print you can get your business started without committing to large prints runs that can be ordered in the future. If there is anything you would like to add to your starter pack please don't hesitate to contact us.